Despite some coaching tips from a Rugby World Cup Winner, Neil Back, and having a couple of retired professionals in the team, on this occasion the “experienced” Frogmore/Deka Bank team succumbed to a narrow defeat to Berwin Leighton Paisner’s youthful exuberance and superior fitness. The score was 5 tries to 3 with one of the tries coming from Frogmore’s Charlie Browne who somehow avoided serious injury in crashing over the line and off the pitch onto concrete to score. An example of just how committed the Frogmore team is at whatever we do. 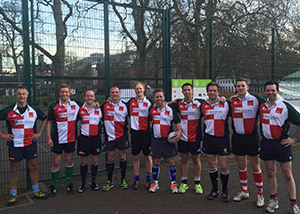 To put the score line into perspective BLP’s oldest player was 29 – whereas the client team had just two or three under 30 and quite a few aged closer to 50. During the post -match analysis the client team thought that if it full contact had been allowed it would have been a different outcome!